I think I had first heard about saimin whilst reading a Lucky Peach article on it. I was literally about to embark on a solo trip to the Big Island of Kona for the first time and was so excited to hear about Hawaiian food that differed from poke, loco moco or shaved ice (although I love all those as well!). I was all alone on that trip and had my own personal goal of diving deep into Hawaiian food and culture. Saimin was one of the foods I wanted to try. Hawaiian food and culture is really a mish mash of a number of other cultures - Japanese, Filipino, Chinese, Korean and Native American. This really shines through in their food. There is so much influence from these cultures like char siu, BBQ kalbi ribs, and even down to the noodles they use. It's the perfect marriage of cultures which is why I am drawn to Hawaiian food so much. Saimin is a prime of example of this. I want to say that saimin is the love child of Japanese ramen and Chinese food, only because those are the only foods i can relate it to. But what exactly is saimin? It's a traditional Hawaiian snack food - a noodle soup (!) 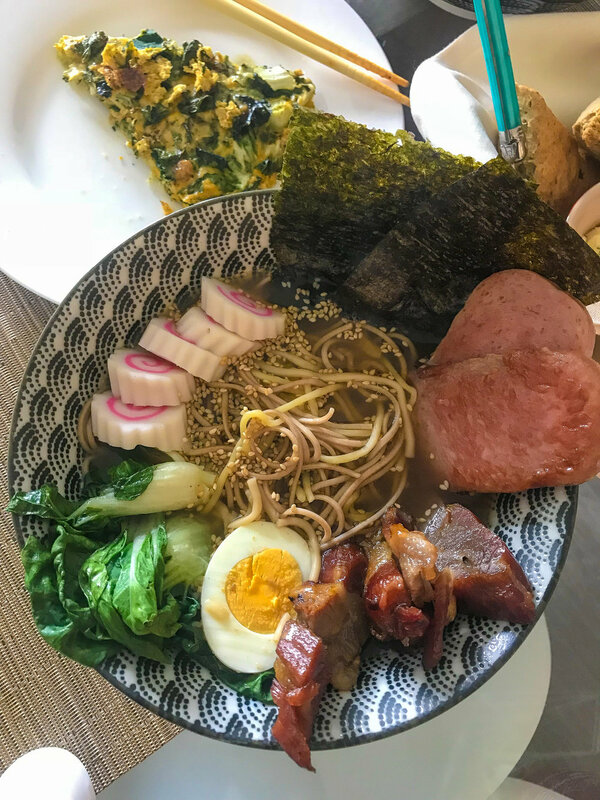 - consisting of fresh ramen noodles, char siu, boiled egg, scallions, dashi broth, seaweed, kamaboko and pan-fried pieces of Spam. Like ramen, of course, the topping choices are endless but that was the way I had it in Hawaii in a late night bowling alley (no lie!) and that's the way I'll keep my recipe. It practically screams "comfort food". It's also fairly inexpensive to make - definitely one of my go-tos on a chilly day! In a heavy-bottomed medium pot, bring the water to a boil. Add the dashi powder, ginger and green onion stalk. Bring the heat down to low and add your miso paste. Mix until it dissolves. Keep the broth warm on the stove while you prepare the other ingredients for assembly. All of your ingredients should be prepped and ready for assembly. Start a deep ramen bowl and add your noodles, about 100-125g per bowl. Add the Spam and char siu to the sides of the bowl. Layer your sliced kamaboko, egg, bok choy and scallions. Tuck the large piece of nori behind the noodles so it sticks up and sprinkle the shredded nori, sesame seeds and white pepper. Slowly ladle the broth into the bowl and finish with a drizzle of sesame oil.